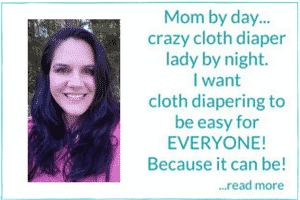 Many of you have been asking… “What about using my prefolds at night?” Absolutely you can! But because many people use 100% cotton, I think it is much easier to do before the age of one. After that, you might have to invest in a few new prefolds and inserts for your stash. It can still be done frugally, so no worries! You CAN make a go of it with what you already have. 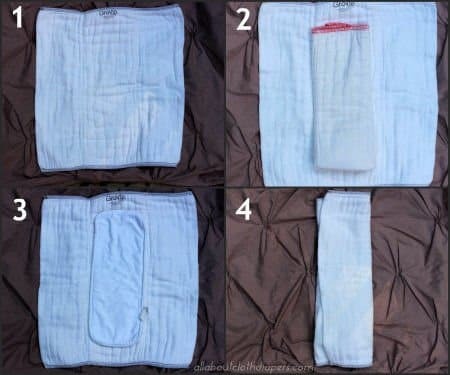 However, for toddlers or very heavy wetters, you might find hemp and bamboo doublers, fitteds or prefolds are a good investment and a sanity saver if you can’t stop night time leaks. Please click here to see a very in depth review of eight different hemp or bamboo inserts! To start off with, let me just throw this out there. Kawaii Goodnight Heavy Wetters or GNHW’s for short! They are a one size pocket diaper made especially for nights, run about $10-12 each and best of all they WORK! I started to write about them here and this post got longer and longer and…..well you get the point. I decided to break it up into another post. Keep your eyes open on Thursday for more info about GNHW, other overnight tricks and my easy tip to fix leg gaps from bulky inserts! Between the GNHW’s and the few fitteds and wool we have I don’t use this method myself because we haven’t needed to. However, many people have said this works for them! Depending on how big your little one is you will need two prefolds, one large and one smaller (maybe a newborn one if you have it.) The smaller something on the inside can be a hemp of bamboo insert or doubler if you really want maximum absorbing power! You just lay out your larger prefold (1) and place the smaller prefold (trifolded) in it (2) or your insert (3), then trifold the bigger one over the smaller one (4). Use this as an insert in your favorite PUL/TPU cover, wool or fleece soaker. That’s it! If this is still not enough absorbency, keep reading! I used a large Grovia Prefold (1), Better Fit Unbleached Indian Prefold (2) and a Thristies Hemp Insert (3). Still having leaks? Use anything made from cotton/hemp and cotton/bamboo blends. Prefolds, inserts, doublers…whatever. These blends are trimmer and absorb A LOT more than 100% cotton or even microfiber. Try to use a thicker, higher quality cover if you have any. Lots of people have had success using Flips, bumgenius, and Thirsties covers. An even better, affordable option are fleece soakers! Fleece soakers are a more affordable alternative to wool. They are super soft, breathable, great at wicking moisture away from baby and are easy to wash. Fleece soakers are often made from synthetic 100% polyester fibers. Fleece needs to be washed after each use but can be washed right in with the rest of your diapers. They are not waterproof, more like water repellent. So it does need to be paired with a nice absorbent combo to work at night. There are quite a few available to buy if you look around on Etsy. Fleece soakers are even more affordable if you can make your own! I found this great post with a free fleece soaker pattern! Click here to check it out! You will need to be stuffing more into these covers (a lot more) than you would normally be doing during the day. Usually, you will need a larger size cover or soaker at night to get all that fluff covered. A larger cover will make the rise come up higher, helping to provide better coverage for belly sleepers. Believe me, you will need the extra space to get the extra absorbency stuffed in. 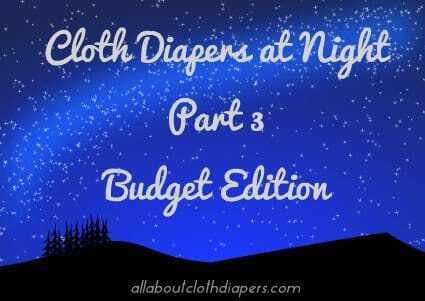 Do you have a bulletproof nighttime cloth diaper solution that didn’t break the bank? 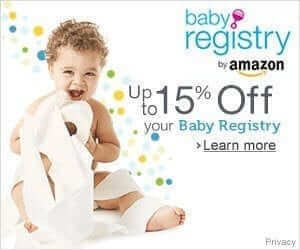 Could you share it and help some other mommas out! Part 6: Absorbency Tests, see how various inserts, fitteds, flats and prefolds stack up absorbency wise. I have been using the Thirsties Hemp prefold with the regular bumgenius large insert stuffed in a pocket (Kawaii or Bumgenius) & so far so good. We are on a budget and their hemp prefold has been wonderful. Thank you so much for this series. Looking forward to your next post Thursday have been considering the Kawaii overnight. Flannel receiving blankets are great for nighttime with my heavy wetter 6 month old. I folds in the origami fold and it lasts all night long. We use windpro (fleece) pockets for overnight! Green Acre Designs makes side snapping ones at about $13 each. I stuff them with Flip overnight inserts plus some bamboo layers as well. It’s been working great!